Before pressing play, keep your head, hands, arms and legs inside the ride at all times. Be prepared to hang on for dear life because this album will knock you right out of your shoes! The long anticipated release of Travis Scott’s new album titled “ASTROWORLD” has heart stopping drops and exciting loop-de-loops within every single track. Every song title on the album is capitalized. Right from the get-go, Scott hits you with a melodic beginning on “STARGAZING” that transforms midway through into a club banger that would shake any street corner in the world. On Apple Music, the features on the album aren’t there. It serves as a surprise to consumers. I was delighted to hear Frank Ocean’s angelic sound on “CAROUSEL” and Drake’s distinctive lyrics on “SICKO MODE.” The beat changes on “SICKO MODE” are similar to switching gears in a Lamborghini proceeding to hit 200 miles-per hour. “R.I.P. SCREW” serves as a celebration and remembrance of the late Houston music legend, DJ Screw. Most rappers who come from Texas tend to give thanks to DJ Screw because he pioneered the overall uniqueness of Houston rap. DJ Screw’s sound is still heard across platforms of rap music. “STOP TRYING TO BE GOD” is my downright favorite song. The harmonic hums of Kid Cudi and the sample of Stevie Wonder’s harmonica could warm the coldest soul. Artists James Blake and Philip Bailey also chip in their two cents to create a beautiful chorus and bridge. After all of those deathly drops and sharp turns, Travis lets his audience catch their breath until the next big drop. Pharrell Williams and Tame Impala use their talents to create a wonderful earthy vibe on “SKELETONS.” Artist the Weeknd plays a role on both tracks and on “WAKE UP.” He delivers a vibe of the wonderful feeling of staying in bed. Travis then switches back into fifth gear with “5% TINT.” It pays homage to another Houston rap legend Slim Thug on his hit song “Still Tippin’.” I would advise to listen to this song in a car with subwoofers because it feels like being in a massage chair. The song “ASTROTHUNDER” has an atmospheric and space-like sound to it that had myself daydreaming until it ended. Travis proceeds to take you into his hideaway with “YOSEMITE;” the sound put my mind into a state of relaxation and restoration. “CAN’T SAY” brings forth a memorable chorus that my thirteen year old cousin even echos! Along with the help of Migos members, Quavo and Takeoff, Travis takes “WHO WHAT” to the next level of what it means to be “lit”. They hit the trifecta with this track! 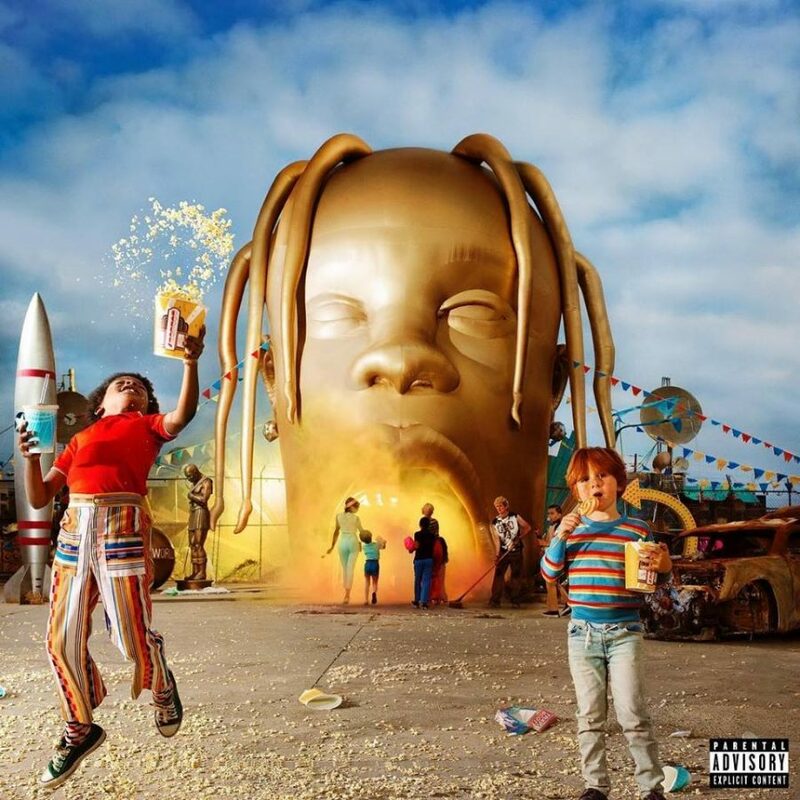 Many Travis Scott fans were happy to see “BUTTERFLY EFFECT” on the last leg of the album. The thrills of the roller coaster are still there, but it’s obvious the album is coming to an end. The hard-hitting sound of the hi-hats, which is a percussion instrument, on “HOUSTONFORNICATION” dishes out a magnificent sound that represents the last big drop on this space themed ride. Travis wraps up the album nicely with a mellow feel with “COFFEE BEAN.” As the song nears its end, fans are preparing to arrive back to the entrance of “ASTROWORLD” to get off the ride and head on home. Travis Scott hits a grand slam with this project. There used to be a Six Flags AstroWorld in Houston, but it was shut down back in 2005. Travis Scott’s album fulfills a resurrection of this theme park that will have your adrenaline pumping after it’s conclusion. I highly advise everyone to listen to this album no matter what your music taste is!